” Investigators said an ongoing dispute over a man escalated, and a woman in her 20s, her mother and a pack of eight or nine other women went to the victim’s house with a baseball bat and a box containing an unknown number of white rats. ” Hundreds of teenagers stormed and trashed a Brooklyn mall in a wild flash mob that forced the shopping center to close its doors during day-after Christmas sales, sources said on Friday. ” Apparently the gun haters have decided that since they can’t convince business owners to post anti-gun signs, maybe they should post the signs themselves. 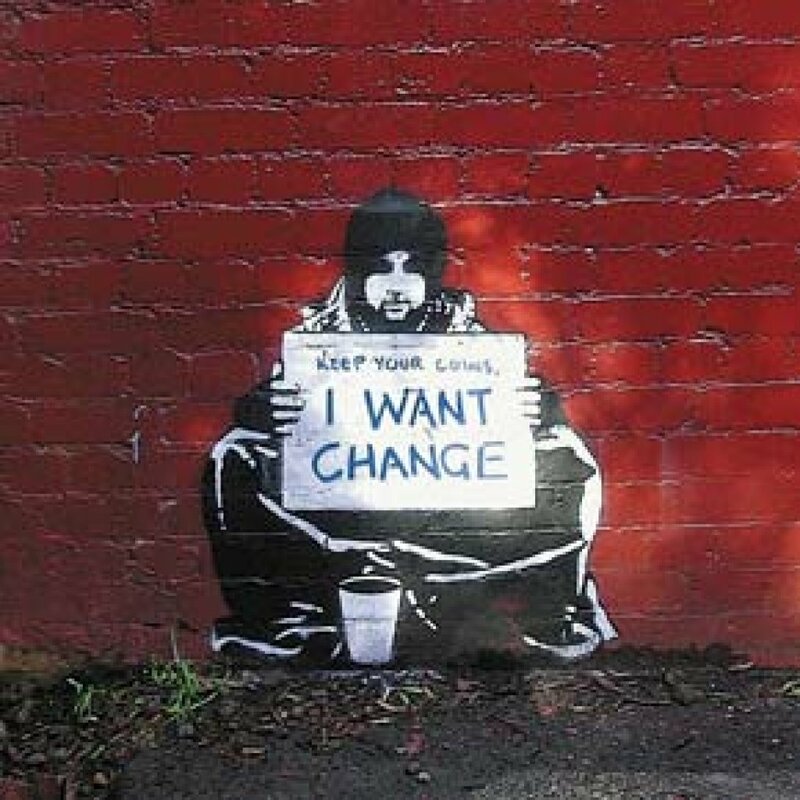 Guerrilla Painter Banksy … Artist Or Criminal ? ” To be a brand name in guerrilla street art is to be in exclusive company. And no one has built a bigger brand imposing his stencils, spray paintings, and sculptures on the world than Banksy. His latest installation, a scattershot, month-long spree of works called “Better Out Than In,” proved that to anyone who pays attention to New York City. Every day, across the five boroughs, the secretive artist debuted a fresh piece in a new location, spawning excited Instagrams, an interactive street map, and, yes, grumbling critique: not just from nannyesque Bloombergians, but the kinds of property rights advocates who sometimes cross swords with the Mayor. That is art Banksy style: sticking it to the man, and maybe to you too. Read more at Reason.com and as fate would have it the New York Post has an article about Banksy in today’s Sunday edition . Here is a link to the artist’s page as well as his Wikipedia page for those that want more . ” The Lego chopper, believed to be the biggest ever made, took Melbourne-based Lego “certified professional” Ryan “The Brickman” McNaught six weeks to build but was smashed to pieces by vandals in a mall in Cairns, in north Queensland. Police are scouring surveillance footage after a tourist said he witnessed a group of youths push the model over before they fled the scene. ” Police say union workers “almost certainly” torched an under-construction Quaker meetinghouse in northwest Philadelphia four days before Christmas. The Chestnut Hill Friends had hired non-union labor for the project, which discommoded several construction unions. ” The suspected arson occurred sometime between 4 p.m. Thursday and 6 a.m. Friday at 20 E. Mermaid Lane, according to police. The incident drew the Philadelphia Fire Department, a bomb squad and representatives from the Police Civil Affairs Unit. No explosives were found on site, according to police. About a dozen locations at the site – the future home of a brand new worship space for the Chestnut Hill Friends Meeting – were allegedly targeted, said Rob Reeves, owner of the merit shop E. Allen Reeves, Inc., the general contractor for the project. Vandals cut anchor bolts and took acetylene torches to structural steel columns in the future meeting house’s community room, said Reeves. The cab of a subcontractor’s crane also suffered significant fire damage. Reeves noted that the construction site’s superintendent reported that five or six union representatives from different trades had recently come to the building site. One had even made threatening remarks, said Reeves. The alleged attack, said Reeves, is about power, with the ultimate goal of union control of all construction work being done in the city. He said violent tactics continue because politicians, the business community and the public do not condemn it. On the screen we see an engineering contractor who wants to enter the controversial Goldtex construction site at 12th and Wood streets, only to find his path blocked by eight union men. With mincing steps, the non-union contractor—a middle-aged man in a blue short-sleeved shirt—tries to sneak in behind them, sidling through a narrow gap between a temporary chain-link fence and a stone wall. But the union men spot him, move toward the fence, and start to lean against it. Then we see four of them take turns pushing—using the fence like a microscope slide to fix the contractor against the wall. In one of the videos, you can hear the man start to cry out, his voice tremulous as he’s crushed. Finally, he slumps to the ground. The most troubling part, though, isn’t the sight of the men trapping the contractor; it’s the brief glimpse of one of the protesters grinning as the contractor wails. And the way the union guys stroll casually away from the scene when their victim collapses. “It’s standard for construction sites to have surveillance cameras,” says one of the two 30-something brothers responsible for capturing the incident on video, Michael Pestronk. “The only novel thing we did, which just seemed obvious to me, was to post the videos on the Internet.” And with that, everything changed. Until this year, getting something built in Philly meant meeting union demands. No one had dared to challenge the power of this city’s Building and Construction Trades Council, a consortium of nearly three dozen unions representing 45,000 people. Then Matt and Mike Pestronk undertook the renovation of the old Goldtex ladies’ shoe factory in the Loft District part of the city, a 10-story building they planned to convert into 163 apartments. A $38 million project, the Goldtex deal is just the sort of high-profile, good-money job this city’s unions have held a lock on since—well, forever. But the Pestronks first did the unusual: They bid the job out to both union and non-union contractors. Then they did the unthinkable: They awarded union contractors just 40 percent of the deal, including demolition and electrical work. The rest isn’t history so much as history in the making. The unions responded to the Pestronks fiercely, declaring a mixed site of union and non-union workers a “disaster” and refusing what work they were offered. “All or none” went the battle cry, a herald of time-tested tactics. There’s more, but all of it is typical of the rough-and-tumble sport of Philadelphia development. What was new was the response. Instead of cowering or capitulating, the Pestronks used batteries of video cameras to record the activities of picketing union members, which they posted online at YouTube and a website they dubbed “phillybully.com.” And the effect was galvanic. For many years, Building Trades has been criticized—usually in fearful whispers—for stifling development and economic growth, shutting out new investors, and undermining this city’s entire political process. But the videos shot and posted by the Pestronks provided something to go with all those allegations: evidence. Footage of leering, chuckling union men spitting profanities—so afraid of losing what they have, they can’t see what they’ve become. Since the first videos went up in spring, the tide of public sentiment has turned, and the Pestronks won a court order restricting the picketers’ behavior. But in coming years, the Goldtex battle and the techniques employed there may be seen in grander, historical terms: as the moment that started the unraveling of Building Trades’ vast economic and political power, and perhaps of Philadelphia’s entire power structure. So this is a story about more than how new-school technology defeated old-school bully tactics. It’s a story about how a single apartment building, and the two guys who wanted to build it, created the opportunity for an entire city to come unstuck in time.